My mojo has been good to me, I am 3/4 through my Christmas card list. This latest one is another Kenny K digi, which I am also entering into the Merry & Bright Christmas theme challenge. I have used ProMarkers, Waterfall stickles, some doilies and Spellbinder Dies. Short and sweet today's post. Absolutely beautiful Adie! Love the light blue :) Thanks so much for playing with us at Kenny K’s Krafty Krews *Merry & Bright* challenge ! Good luck in the draw and spotlight! If you have a Facebook account, we have another fun contest happening. Find it here. Hope to see you there! Love this image, she is one of my favourites and she looks fab in pale blue. Great dies as well, very pretty card. Super cute card. 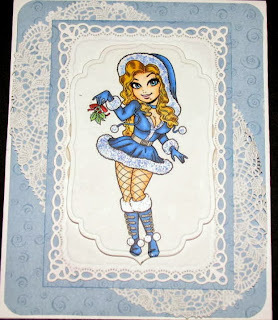 Your coloring if fabulous and I love the Spellbinders cuts. Thanks for entering our "Merry and Bright" challenge at Kenny K's Kraft Krew. Good luck and I look forward to seeing more of your creations in the future!